The battle against Genetically Modified Organisms (GMOs) is central in the ongoing fight between transnational corporations and the health and sovereignty of the people of Venezuela. Despite Hugo Chavez’s ad hoc ban on transgenic crops in 2004, large multinational corporations, like Monsanto, are trying to use the current economic climate to negotiate for the arrival of GM seed in Venezuela. A seed law proposed by a pro-government legislator in 2013 was met with harsh criticism from environmental and campesino movements, who claimed that it would create a backdoor for transgenic seeds to enter Venezuela. After a year of deliberating, and a complete re-write of the seed law through assemblies and gatherings of popular power, a new seed law was approved for discussion by the National Assembly. This revised law completely bans the use of GM seeds in Venezuela. Since 2004, when President Hugo Chavez halted the planting of 500,000 acres of Monsanto’s GMO corn, Venezuelan farmers have been firmly united against the growing of transgenic crops and the importation of transgenic seeds. When Chavez announced this decision to the world, in April of 2004, he stated, “the people of the United States, of Latin America and the world, should follow the example of Venezuela and be free of transgenics.” And, while Article 127 of the 1999 Bolivarian Constitution prohibits the creation of patents on the genome of any living being, it does not explicitly ban the planting, use, or consumption of GMOs. The signatories of the statement participated with various other agricultural producers, indigenous organizations, and other stakeholders in the drafting of legislation. This action reclaimed seed policy from the National Assembly and brought it directly into the hands of producers and those most impacted by seed policy. Ureña listened to the criticism brought on by a diverse coalition of “ecosocialists” and he participated in a gathering organized by the national network of the seed guardians in Monte Carmelo, Venezuela in October of 2013. After a series of gatherings and ongoing protests against transgenic seeds in Venezuela, José Ureña (PSUV) introduced the new seed law—built through popular participation—to the National Assembly, yesterday. 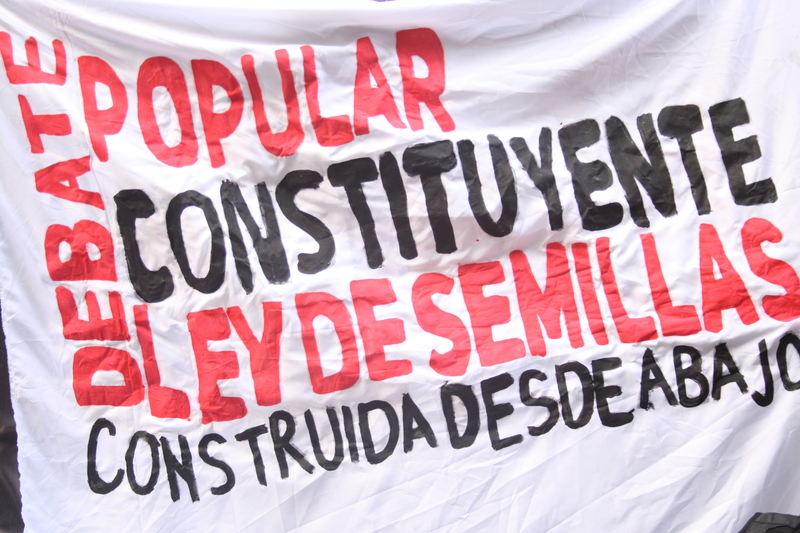 The proposed law was approved for discussion in the National Assembly, and the debate on seeds will continue, as will the mobilization of social movements in the streets. The new Seed Law, if passed, would establish a National Seed Institute that would regulate the quality of imported seeds but, as a result of the demands made by producers, would not create undue burdens on producers with which to exchange seeds freely or establish other community-based institutions for the preservation and sharing of seeds. These adjustments were birthed through the democratic process of debate and were formed in response to criticisms of the past version of the law, which small-producers noted as centralizing too much power in the hands of the national government and failing to recognize community based institutions, like the commune or the communal councils as legitimate bodies in the care and guardianship of seeds. José Ureña stated, “the seed is a right of the people, it is the patrimony of humanity, and consequently, it cannot be privatized.” Hundreds of Venezuelans gathered outside of the National Assembly to show their support for the new Seed Law, and to continue to demand a ban on transgenic seeds and crops in Venezuela. While Venezuela has been marching under the banner of food sovereignty as a guiding principle to resist neoliberalism and the rule of multinational corporations, the oil producing nation has only recently confronted the harsh consequences of its food dependence; the food shortages and distribution issues within the country are the core of the economic war. As Venezuelans are being pushed to be ever more resourceful, to go without, or to pay exorbitant prices for basic goods in the informal market, the conversation on food sovereignty has now transformed from a theoretical concept to a concrete demand shared by Venezuelans across the political spectrum. In a time of widespread scarcity within the country, multinational corporations, and the opposition politicians who represent their interests have attempted to take advantage of fear around access to food, to push for the use of GMOs. In October of 2012, Rafael Aramendis, Monsanto representative for government affairs for South America, the Caribbean and the Andean region, addressed the National Assembly, promising that GM crops were a means to increase food production in Venezuela. According to the Council on Hemispheric Affairs, Aramendis’ visit to Caracas was accompanied by a lobbying efforts to dismantle Venezuela’s current ani-transgenics policies. Today, as the new Seed Law is headed towards debate powerful interests, like Venezuela’s Chamber of Commerce (Fedecamaras) oppose the bill, and they are using the arguments presented by Aramendis that transgenics could be an answer to Venezuela’s supposedly low levels of agricultural production. Opposition legislator and former president of Fedecamaras 2007-2009) stated that officially banning transgenics would be “a step backwards” in agricultural matters. Despite widespread knowledge of the devastating environmental and health impact of GMOs, large multinational corporations, the most-well-known being, US-based Monsanto corporation, continue to lobby for the use of GM crops. Monsanto – like several other corporations in the chemical industry – developed GM crops primarily as a means to create a larger market for their chemical herbicides. As GM crops proliferate, Monsanto’s profits increase. Their herbicide Roundup has been applied in increasing dosages along with the widespread use of their patented “Roundup ready” GM crops which are engineered to be resistant to the chemical. Monsanto has exclusive ownership of the seeds of all of their GM crops. They have also managed to engineer a “terminator seed” which grow into plants that cannot produce fertile seeds, forcing farmers to buy seeds from the multinational corporation annually instead of freely saving their own seeds, as they have done for generations. This creates a dangerous dependence in which poor farmers must rely on this agri-chemical giant and it also obviously violates the natural process of reproduction of plants. Venezuela’s rejection of transgenics closes off Venezuela’s agricultural market to transnational agri-chemical companies like Monsanto, DuPont, Syngenta, Pioneer, Cargill, Dow, BASF and Bayer but it also sets an example to the rest of the world, one that is threatening to the profits and image of these powerful corporations. Even in the midst of food shortages, and the type of fear and panic that accompanies scarcity, Venezuelans are not being fooled by promises of a quick fix to increase food production through opening the flood gates to transgenic seeds; on the contrary, social movements are adamantly establishing the seed as the fundamental starting point for constructing food sovereignty and rejecting further dependence on multinationals, and the environmental devastation that accompanies the planting of transgenic crops and the increased use of agrochemicals that accompany them. There are growing anti-GMO movements all around the world but, Venezuela’s resistance to GMOs is unique and provides extremely important lessons for those who are organizing against genetically modified foods and for food sovereignty. Undoubtedly, the principled rejection of transgenics at the highest level of government in Venezuela under President Chavez, created a powerful umbrella for a broad movement to define its opposition to transgenics and offered legitimacy to the rejection of transgenic crops in Venezuela. But more so, Venezuela’s battle against transgenics has been rooted in protecting Venezuela’s food supply, its land, and its farmers from the dependence and contamination brought on by planting GM crops, simply, it is not a consumer movement. In 1997, the European Union established the first laws on the labeling of GMOs (including animal feed) and since then, consumer rights groups have fought against he proliferation of GM crops by instigating a consumer movement that demands the right to know what is in their food, and therefore the right not to consume transgenic food. This strategy has resulted in campaigns demanding that any product that is comprised of GMO ingredients, be labeled. According to the Non-GMO project, crops at the highest risk of being GMO are, alfalfa, canola, corn, cotton, papya, soy, sugar beets, and zuchinni and they also note possible contamination in crops such as beets, brassicas (bok choy, rutabega, kale, etc) flax, rice and wheat. Additionally, there are numerous ingredients that are derived from these GM crops such as aspartame, high fructose corn syrup, xantham gum and other hard to pronounce additives. And despite early trials of genetically modified tomatoes, potatoes, salmon and pig, they failed on the market and are no longer being produced. The Non-GMO project lists foods that are certified as non-GMO so that consumers (largely, in the United States) can make educated consumer choices and individually opt out of ingesting transgenic foods, if they have the information, access to these foods, and money to purchase them. This has been the largest force of the anti-GMO movement in the United states, which is the largest producer of GM crops in the world. The paradigm of a consumer movement is largely rooted in a desire to protect individuals from the damaging health problems associated with ingesting transgenic foods. This platform often falls short of challenging other issues such as the power of multinational corporations, the dependency of farmers, the environmental consequences of increased chemical herbicide and pesticide use associated with the proliferation of chemical resistant GM crops, and the fight for biodiversity and food sovereignty. In Europe and the US, anti-GMO campaigns are largely couched within a consumer-driven movement that attempts to create these changes through individual choices in the market place. Conversely, Venezuelans have placed the fight against transgenic seeds as the cornerstone to food sovereignty and defending campesino, indigneous and Afro-Descendant culture from the tyranny of multinational companies. This platform, has also been broadly adopted as a part of the strategy to construct eco-socialism and most importantly, has been generated by small scale producers, seed savers, agricultural workers, and campesino communities. Far from being a consumer movement, this has been a grassroots movement of producers and stakeholders who are working to influence change in the political and social sphere; they are not trying to effect change through legitimating the marketplace as the venue of decision-making, they are challenging an economic model that claims ownership over life. This is consistent with how indigenous peoples around the world and the peasant movement in India, have also defined their struggle. Ironically, this collective producer-based strategy, which examines the larger consequences of GMOs and rejects the neoliberal market as the venue for decision-making, has made huge advances in protecting farmers and crops from contamination of transgenic seeds but they have failed to keep products made with GMO ingredients out of the country. Venezuela imports most of its food from abroad, rather than producing it domestically. As Venezuela reorients its trading partnerships away from the United States and towards its MERCOSUR (Brazil, Uruguay, Paraguay, ad Chile) and other South American neighbors, as well as towards the BRICS countries (Brazil, Russian, India, China and South Africa), Venezuela is importing food from some of the larger producers of GMO products. Of the 10 countries with the highest area of GM crops planted, many of Venezuela’s main trading partners make the list, such as Argentina, Brazil, China, Paraguay, India, South Africa and Uruguay. Undoubtedly, basic and widely used consumer goods such as precooked cornflour (the main ingredient in the Venezuelan arepa and empañada), soy bean oil, canola oil, and other consumer items such as diapers, tampons, and menstrual pads made with cotton, are likely made of genetically modified ingredients and therefore contain much higher concentration of harmful chemical herbicides and pesticides. These products are not labeled, and while health concerns associated with exposure to GM products are a part of the overall rejection of transgenics in Venezuela, the movement has largely fought GMOs from the stance of farmers and producers, considering long-term effects on land, production, workers, the environment, sovereignty and independence from multinational corporations. This strategy creates a broader and more powerful movement, one that bring in food producers and growers, indigenous and Afro-Descendent peoples, environmentalists, grassroots social movements in rural and urban areas of the country and those concerned about health. This diverse movement frames the issue of transgenics as tied into corporate control of the global economy, the preservation of cultural patrimony and forms of knowledge, the right to self-determination, and an issue of worker’s rights. The coalition-building potential of this approach creates fertile ground for bringing power to control vital resources and decisions about food production to grassroots communities and it extends beyond the fight against transgenic seeds. Nonetheless, in the globalized world in which Venezuela belongs, the country continues to import food which is made of transgenic products, offering few options for consumers to opt out of ingesting transgenics. Despite a push in US states such as Washington and California to pass referendums to label GMO products, the heavily resourced counter campaign by large agri-business have so far defeated these labeling initiatives. But, even where the labeling of GMOs exists or where there are large concentrations of people concerned with GMOs, those who have access to information about the potential harm can choose to buy the pricier certified organic (which means that it must not be GMO) and “non-GMO certified” goods. For those who cannot afford those products, or don’t have access to a natural food store or grocer that stocks such goods, there are few options other than foods produced with GMO crops and so, the poor, the working classes (in rural and urban areas), including farming families, indigenous peoples, and those in institutions such as hospitals, schools and prisons will continue to largely eat GMO foods despite the labeling of products or the knowledge of the health risks. Another weakness in the consumer-based model is that agri-chemical companies and labeling efforts may adjust their practices to meet consumer demands without addressing any of the fundamental problems that Venezuelans are raising in their effort to ban transgenics. Venezuela’s opposition to transgenics outlines a strategy that is not rooted in consumer choice, and therefore fully rejects the neoliberal logic inherent in consumer-based movements. While Venezuela has a long way to go in building food sovereignty, increasing food production and ensuring that Venezuelans are protected from the damaging health consequences of GM foods, they are addressing the problem at its root, beginning with the seed. The new Seed Law will be debated in the National Assembly and despite support across many sectors of Venezuelan society, it will still face a well-funded opposition from pro-corporate legislators that are in the pockets of big business. While passage of the bill would mark an historic step forward in Venezuela, the process which has birthed the proposed legislation is a victory in of itself. The legislation came from thousands of people, debating and discussing seeds, corporate power, culture, land, food production, and sovereignty all around the country and social movements are continuing to put pressure of the government to pass the legislation. There are street protests called for tomorrow and for later this month. It is clear that the movement is growing strength and numbers, as food sovereignty becomes defined through a participatory process from the grassroots up. This movement is starting with the seed, but now that it has been planted, we must watch to see how the movement will grow and what we can all learn in the process. « President Nicolas Maduro announced this weekend several measures to challenge “food mafias” and to secure the nation’s food sovereignty.